Would like to share and thank the Rafu Shimpo, a Japanese-English newspaper since 1903, for featuring our brand. The Rafu is an important institution for Japanese-Americans as it’s where we get our community news. Old folks looked at the obituaries and the youngins went to the sports page. I used to always check and see what other basketball players were doing and had to peep my own stats too, “was my 42 point bombing in there?” It was our ESPN. If any of you young folk out there are interested in content creation, journalism, writing, etc and want to get more involved in the community, I urge you to approach them with your ideas and stories. They’re good peoples and I’m most certain they are open to work with you. You guys are the future and are already killing the social and digital space, why not do it for your own peeps? Darin Maki’s CRFT celebrates Japanese American culture. Part of an ongoing series featuring Nikkei entrepreneurs in collaboration with @LASmallBizcubator and Little Tokyo Service Center. Check your nostalgia at the door, CRFT by Maki is a clothing brand and producer of short films that brings Japanese heritage into a light that rejects ideas of traditional culture as static and distant, or the peak of the Japanese American community as a bygone era. This new company, launched in just January 2018, strives to celebrate Japanese Americans and look forward to an even brighter future. Creator and Los Angeles native Darin Maki incorporates his heritage into his work in a way that recasts it all in a refreshingly vibrant glow. 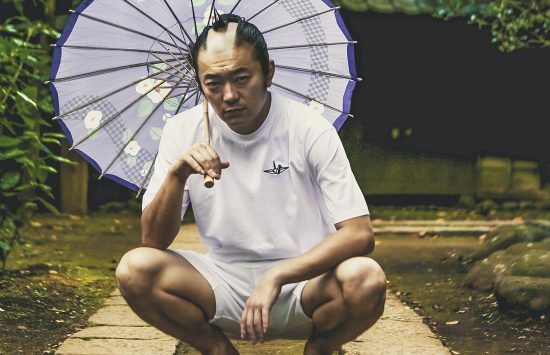 “It’s not just a brand — it’s also authentic cultural representation and identity,” said Maki. On the CRFT by Maki Instagram page, www.instagram.com/crftbymaki, models for the brand are presented in iconic Japanese and Japanese American locations such as the Gardena Bowling Center, the streets of Shibuya and a corner in Crenshaw near Tak’s Coffee Shop. These unique backdrops however hardly come off as staged or obscure, instead the models confidently inhabit the environments with ease and individuality. Meanwhile the sporty CRFT by Maki clothing on them catches the eye with that simple but ever elusive silhouette of the perfectly constructed tee, hoodie or crew neck. “I make things I’d want to wear, not flashy, very minimal,” stated Maki. “There’s beauty in simplicity.” Accompanied at times with captions that deliver a Japanese American historical angle in a manner both sociological and streetwise, this company has not just a look but voice all its own. The origami crane serves as the company’s logo, and is featured on every item. It’s possibly one of the most recognizable symbols of Japanese culture, and here it hardly looks delicate or fragile. With solidly drawn black lines outlining its shape, this is an origami crane folded to be solid and strong. Darin Maki, the creator of CRFT by Maki, stands at the corner of First and Judge John Aiso streets in Little Tokyo where his great-grandmother once ran her own small business. Every item in the clothing line was carefully created by Maki with proper fit in mind. He sought to make clothing that not only looked the way he wanted, but fit well and was made with high-quality stitching and fabric. “All the garments are hand-sewn and I’m part of the process from beginning to end,” he said. Maki’s mother hails from Boyle Heights and grew up in Crenshaw, where there were once sizable Japanese American communities. His father Eddie, meanwhile, moved as a child to Boyle Heights in the 1950s from Kagoshima. Maki grew up in Montebello, but feels no stranger to the neighborhoods of his family tree, which also includes Little Tokyo. His great-grandmother once operated a Japanese homestyle restaurant in Little Tokyo on the block near First and San Pedro, where there were once many Japanese shops and eateries. Today the beginning of that block is marked instead by Toriumi Plaza, formerly the site of the car wash for the LAPD, who took over the block in the 1950s after the city cleared the area by eminent domain and razed all the Little Tokyo buildings to the ground. And for over two decades, Maki’s grandmother worked in the packaging department for the historic Umeya Rice Cake Co. Umeya closed at the end of 2017 after 92 years in business almost completely in Little Tokyo, with the exception of the years affected by Japanese American internment. The Los Angeles Times called their closure the end of an era. It was Rafu Shimpo, in fact, that listed notices of party locations, and the new generation of Japanese Americans went to places like Roger Young Auditorium and Parkview Women’s Club to meet. Like his parents, Maki was also always active and engaged — aside from his love of style, he also was an avid basketball player. Maki played for East Los Angeles College while taking courses in subjects he found interesting like sociology and anthropology. While playing for ELAC in a scrimmage against a Japanese national team he was noticed by the head coach, who invited him to try out for a professional league in Japan. After finishing his junior college degree, Maki traveled to Japan and was offered a contract, only to find out that he was not eligible to play because he didn’t have Japanese citizenship. He returned home to the U.S., completed his bachelor’s degree at California State University Dominguez Hills and continued to play on a competitive Asian American travel team in Southern California. During a tournament that took the team to Asia, where the team regularly ousted national teams, he spoke to a scout who recommended he gain Japanese citizenship via his father, who was born in Japan. After being naturalized, he resumed his path into Japanese professional basketball, the B.League, ultimately being drafted sixth overall. He went on to play for the Tokyo Apache, and made a new home in Tokyo. Maki immediately took to the city, residing near fashion-forward Shibuya, spending time at its hip-hop clubs, the bustling streets of Shinjuku, the night life of Roppongi, and the unique style scene of Harajuku. Even while playing professional basketball and immersing himself in Tokyo life, Maki continued to make his own clothes just as he had growing up. When a basketball fan club asked him to design a T-shirt he was happy to oblige, and the design sold so well it planted the seed that perhaps his eye for design and style could be a career after basketball. After leaving professional sports, however, things took a different turn. Maki was offered a prestigious position with an Asian airline, and spent the next few years traveling for work and learning about the corporate world. With this experience under his belt, he returned to Los Angeles, determined to launch his own business. But Maki was not satisfied with simply creating a clothing line, he wanted to also use his interest in filmmaking. In the “Feels” section of crftbymaki.com he publishes in-depth short films that aim to put the stories of Japanese Americans into the limelight. “I always had a video camera in hand and was documenting things,” explained Maki on his interest in filmmaking. Brian and Korey Kito of Fugetsu-Do model CRFT by Maki designs. Maki has also featured the father and son in a short film on his website. 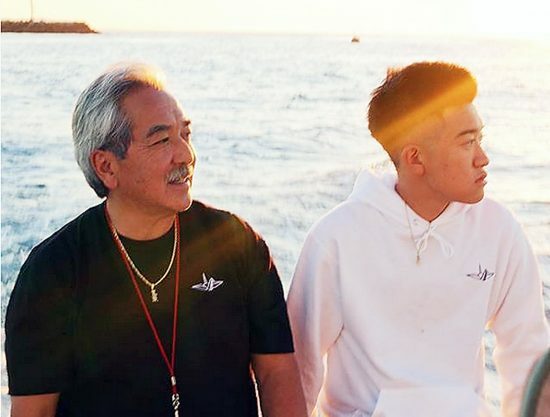 The first video focused on 114-year-old mochi and manju store Fugetsu-Do in Little Tokyo and the aspirations of young Korey Kito, just a senior in high school, to continue the family business. The latest video profiles the career path of Natalie Nakase, a third-generation Japanese American and former professional basketball player who became the first female head coach for a Japanese men’s professional team, and currently works as an assistant coach under Doc Rivers for the Los Angeles Clippers. For Darin Maki, realizing his own dreams of creating his own clothing line goes hand-in-hand with supporting the dreams of others. “It’s fashion for people who love not just the style, but also the message,” he said. CRFT by Maki will have its first-ever pop up store event in Little Tokyo from 12 to 8 p.m. on Thursday, Sept. 20, through Sunday, Sept. 23, at 341 FSN, 341 E. First St., Los Angeles. This event is a partnership between @LASmallBizcubator, Sustainable Little Tokyo, and Little Tokyo Service Center’s +LAB. Part of Sustainable Little Tokyo’s “ART@341FSN,” the event aims to invite entrepreneurs into Little Tokyo and be part of the legacy of Little Tokyo’s small-business community.